It has come to my attention recently that I may have a sweet potato problem. But you know what, so does the rest of the foodie world. Sweet potatoes are popping up everywhere nowadays. I've been craving them constantly. And really, who wouldn't? They're so versatile! Baked, steamed, mashed, fried, or pie'd this root veggie should be your new go to side dish! Like the name says, they're sweeter than their starchy counterpart, the potato and offer way more in the nutrient department so I can feel better about eating them! 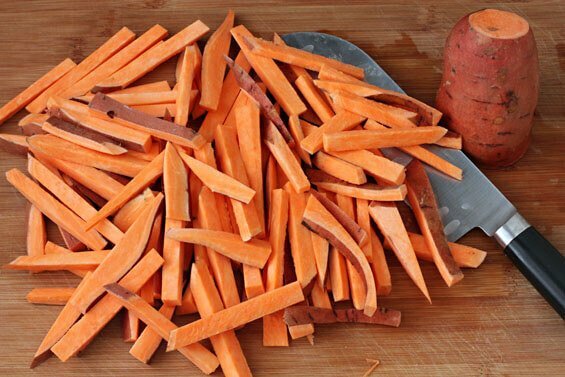 Sweet potatoes are rich in dietary fiber, beta carotene, Vitamin C and Vitamin B6! When I'm in need of a quick sweet potato fix I usually head to a local market near my office that serves up these sweeties in fry form but if you have the time I definitely recommend you try this recipe for Baked Curry Sweet Potato Fries created by the ever amazing Joy the Baker! It's healthy too! We love sweet potatoes too! Will have to try the sweet potato fries recipe!